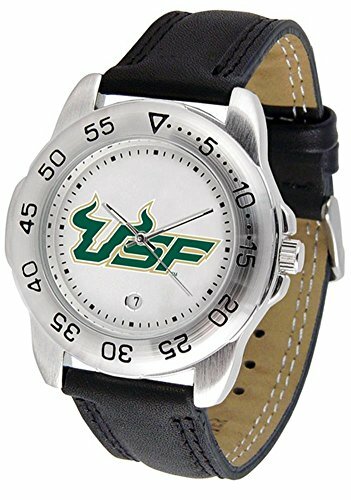 South Florida Bulls men's workout sports watch. This Bulls exercise watch with a genuine leather strap. A date calendar function plus a rotating bezel/timer circles the scratch-resistant crystal. Sport the bold, colorful, high quality logo with pride. This sporty watch is perfect for any sport and any workout. The scratch resistant face protects the watch from the hardest workouts and the most dedicated athletes. Water resistant up to 3 ATM.